I believe that eyebrows frame the face and make a terrific difference to the way we look. Whether you need subtle enhancements, reshaping, or need to create hair where there is little, or no hair, Microblading is the answer. No more time consuming “drawing on” of eyebrows! I specialise in soft, natural looking brows, that will enhance your look and give you the added confidence you need, without having to apply eyebrow makeup. Microblading is now the only technique I use to implant pigment into the skin. I no longer use the machine technique, (as seen in one of my videos) as I believe the Microblading method creates the very finest of hairstrokes. I consider this the best eyebrow treatment, as the results are so beautifully natural. My motto is “Eyebrows should look like eyebrows! I was very apprehensive before getting this done. 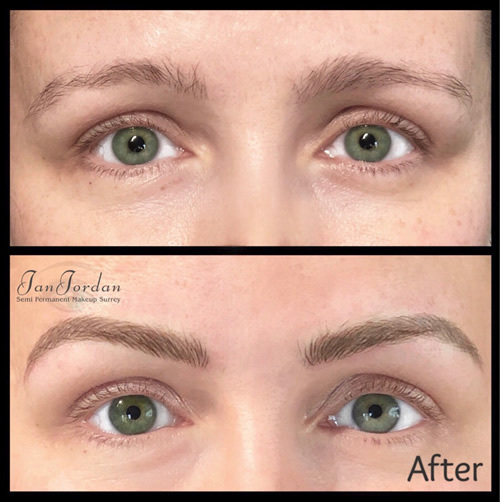 I was very shy, having no hair on my eyebrows and scared about whether it would hurt and if it would look nice, but when I went for the consultation with Jan, I realised I couldn’t have found a better person for the job. She was friendly, kind. On the day of my treatment Jan explained everything as she went, making sure I was happy at every stage right until the end. After having it done my eyebrows look fantastic, but that doesn’t compare to how much I’m smiling now. I’m so much happier and anyone thinking of having this done, needs to have a consultation with Jan and they won’t look back. 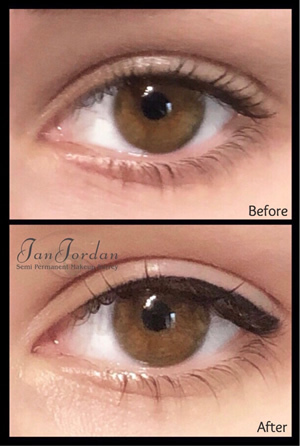 Semi-permanent eyeliner can be applied to both top and bottom eyelids. It can be a very subtle lash enhancement, or more of a makeup look. Please be aware that if it's a heavy liner look you're after, I'm going to have to say no. I believe that when it comes to eyeliner tattooing, less is more! It’s so nice to wake up in the morning with beautiful eyeliner, and a real joy if you’re on holiday, especially if you like to swim and still have smudge free eyes. 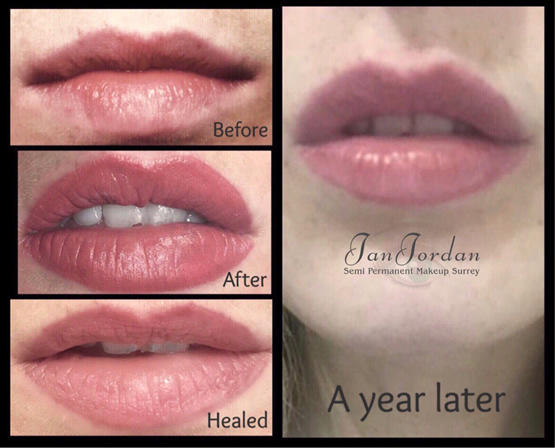 Lips will looks luscious and natural with semi-permanent make-up. The pigment shade is matched very closely to the natural colour of your lips, and really helps to define your mouth. A gentle blush is carried onto the lips from the liner, giving you a beautifully subtle look. Whether wearing your favourite lipstick or just a little lip gloss, you are ready to face the world. 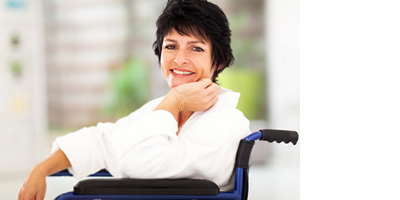 For those clients who feel they would be happier to be seen at home for reasons of heightened confidentiality, or because of problems with mobility, Jan Jordan offers a "Home visit" option. In certain circumstances confidentiality and anonymity are essential. We have an unrivaled reputation when it comes to client privacy. For some, a "Home visit" is of paramount importance. At the Clinic we see many clients with conditions such as Parkinson's disease, Multiple Sclerosis and other debilitating conditions, but we also realize that travel is not an option for some clients and we are pleased to be able to help under these difficult circumstances. "Applying makeup can be a real chore, if not an impossibility for some people. 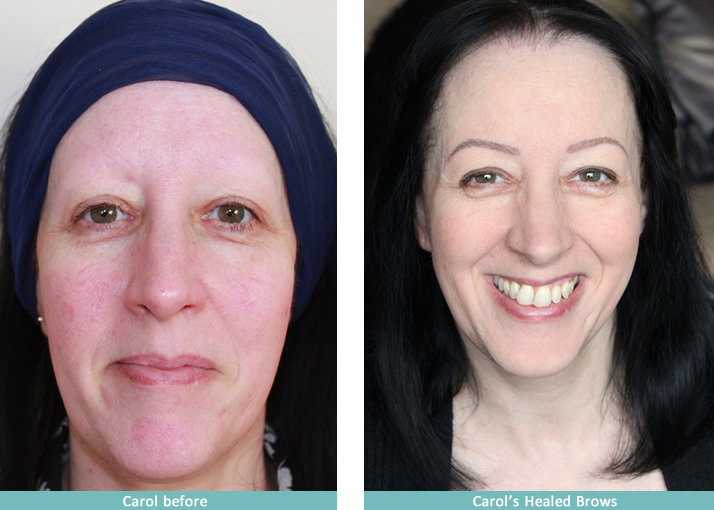 This is where Semi Permanent Makeup really comes into its own." "Please note that an extra fee will be applicable where home visits are concerned, as travel costs and time away from the clinic must be taken into consideration. Please contact me for an exact quote." "In certain circumstances, i.e., if mobility is a problem, or you need to protect your anonymity, a "Home Visit" can be arranged. Please contact me for further information."